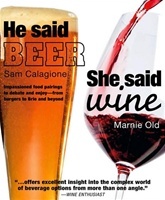 "He Said Beer, She Said Wine"
He Said Beer, She Said Wineis the first fully illustrated book on the market to give in-depth instruction on how to successfully pair both beer and wine with a wide variety of foods. 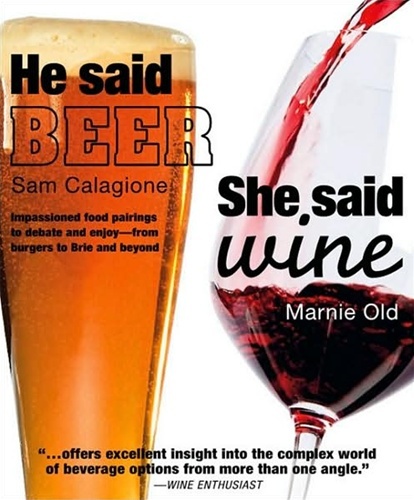 Co-authored by Marnie Old, an esteemed sommelier, and Sam Calagione, owner of the renowned craft brewery DogFishHead He Said Beer, She Said Wineteaches you everything you need to know to get the best out of your beverages, with food or without. Each author divulges the secrets of their respective trades, using clear, easy-to-understand language-and, of course, a little good-natured banter to keep things lively. The book is full of fantastic tips and tricks, specific beer and wine recommendations, and interactive elements to help you identify your preferences along the way. So, from cheese to dessert, you'll always know what drinks to serve for sublime flavor combinations. Never ones to skimp on a bit of fun, Marnie and Sam also show you how to host your own at-home version of their sold-out He Said Beer, She Said Winetasting events, where diners taste one beer and one wine selection with each dish, and then vote on their preferred pairing. He Said Beer, She Said Winegives you easy-to-prepare dishes, complete with step-by-step recipes and sumptuous beverage selections.